AUBURN, Ala. (AP) The Auburn Tigers have a make or break month ahead of them. The 16th-ranked Tigers have briefly cracked the Top 10, run away with several Southeastern Conference victories and also blown a 20-point lead. Now, tailback Kamryn Pettway is out for an extended period with a fractured shoulder bone with a string of big games coming up. Auburn (6-2, 4-1 Southeastern Conference) starts a big November Saturday at Texas A&M (5-3, 3-2) with potentially even bigger games at home against chief rivals No. 2 Georgia and No. 1 Alabama looming after that. The Tigers could return from College Station in control of their own fate in the SEC Western Division race, or in danger of a fourth straight season with eight wins or fewer. 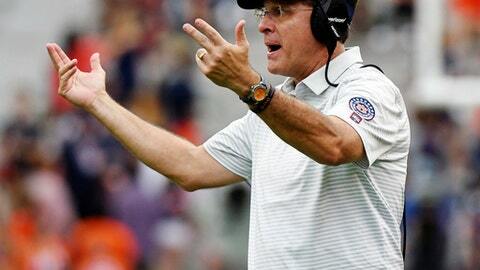 ”I think this time of year the games are so important,” Auburn coach Gus Malzahn said Tuesday. They’re especially big because Malzahn and the Tigers have been swept by Georgia and Alabama three straight years. First things first. Auburn faces a Texas A&M team coming off a 35-14 loss to No. 21 Mississippi State . The Tigers are 15-point favorites but they’ve flopped in a similar situation. They blew a 20-0 lead against LSU to end a one-week cameo ranked No. 10. Auburn seasons can often be judged a success or failure based on what happens in November since the final two SEC opponents are the team’s biggest rivals. And right now, the Crimson Tide and Bulldogs seem on a collision course to meet in Atlanta for the league championship. The Tigers would likely have to win out to make the SEC title game. Safety Tray Matthews welcomes the high stakes. ”It’s very exciting. This is where all the fun starts,” Matthews said. ”You get remembered in November. We wouldn’t have it any other way. We play the No. 1 team, the No. 2 team at our house. I mean, it doesn’t get more exciting than that. That’s what we live for. He said the injury occurred late in the game with Arkansas and it was diagnosed last Friday. Pettway rushed for three touchdowns against the Razorbacks. Kerryon Johnson, who is tied for second nationally with 14 rushing touchdowns, has mostly been the Tigers’ go-to back so far despite missing two games with a hamstring injury. It still leaves Auburn short-handed for the stretch run. Malzahn said he’ll make it clear to the Tigers that they can’t overlook the Aggies for those big games. ”I’m always going to be honest with our team,” he said. ”But our team, they understand the big picture. More importantly, they understand the current picture. All that matters is A&M.